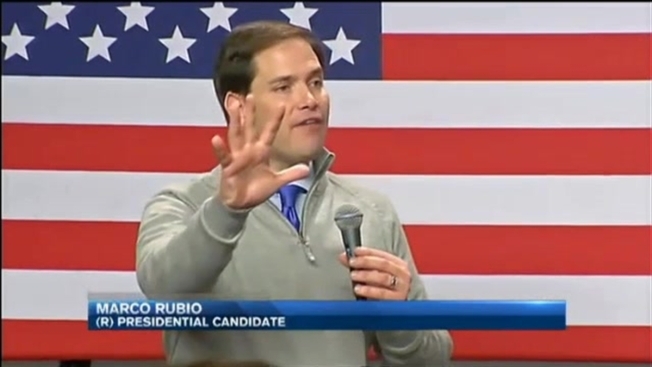 Rubio Speaks at 4 Town Halls in N.H.
Hopscotching New Hampshire with four town hall meetings in one day, Florida Sen. Marco Rubio is riding a wave of support putting him in second place behind Donald Trump among likely GOP voters in the Granite State in the latest UMass Lowell poll. With five days until the first in the nation primary, instead of attacking his Republican rivals, he's focused on the bigger picture. "There is a reason why Hillary Clinton attacks me five times for any time they attack any other Republican," he said to applause. "Because she doesn't want to run against me. But I can't wait to run against her." As Rubio patiently posed for pictures with everyone who wanted one, he attempted to connect with those New Hampshire voters who have not yet made up their minds who they're voting for. "Not yet," said Bill Zeiler of Bow. "Ask me Tuesday morning." "When I see them and get to talk with them, ask questions, it's much different than when you see them on a debate and on TV," said Sarah Reilly of Bow. "And it's kind of changed my mind here and there but I'm still undecided." "I'm going to probably make up my mind sometime over the weekend," said Paul Dowd of Manchester. "Maybe as I walk into the ballot box." Coming off his strong third place finish in Iowa, Rubio feels poised to make a statement in New Hampshire on Tuesday. "We feel good about the progress we've made in Iowa, the progress we're making here now," said Rubio. "I know this about politics - when everyone's attacking you, you must be doing something right." He said: "Here's the good news though. After I wore those shoes, the Florsheim website ran out of the shoe. It was kind of my own personal stimulus package." "So, if you've got any with high heels let me know so I can promote the sales."